Whether you are interested in becoming a professional chef, or you just want to join a few friends for a few hours of baking 101, there are cooking schools of all kinds in the greater Phoenix area. If you are looking for a cooking school where you will make a sincere commitment, both in time and financially, to obtaining a certificate or degree in culinary arts, here are five options for you in the Phoenix and Scottsdale areas. The Arizona Culinary Institute was founded in 2001 and offers a diploma in Culinary Arts, Baking and Restaurant Management. Arizona Culinary Institute operates a fine dining restaurant that is open to the public. Students run the restaurant as part of their education. The Arizona Culinary Institute is located in Scottsdale. The Art Institute of Phoenix offers degrees and certifications in Culinary Arts, Baking and Pastry, and the Art of Cooking. From time to time they also offer short workshops for people not enrolled in a program of study at the Institute. It is located in West Phoenix. The Phoenix College Culinary Studies and Food Service Administration programs are designed to equip students with the knowledge and training necessary for an entry level or higher career in food service fields. They offer both full time and part-time study, with evening and weekend classes available. The Phoenix College Culinary School has a restaurant that is open to the public for lunch during the spring and fall semesters. Phoenix College is located in Central Phoenix. Scottsdale Community College started their Culinary Arts Program in 1984. Students can earn enroll in the Certificate Program or obtain an AAS Degree. 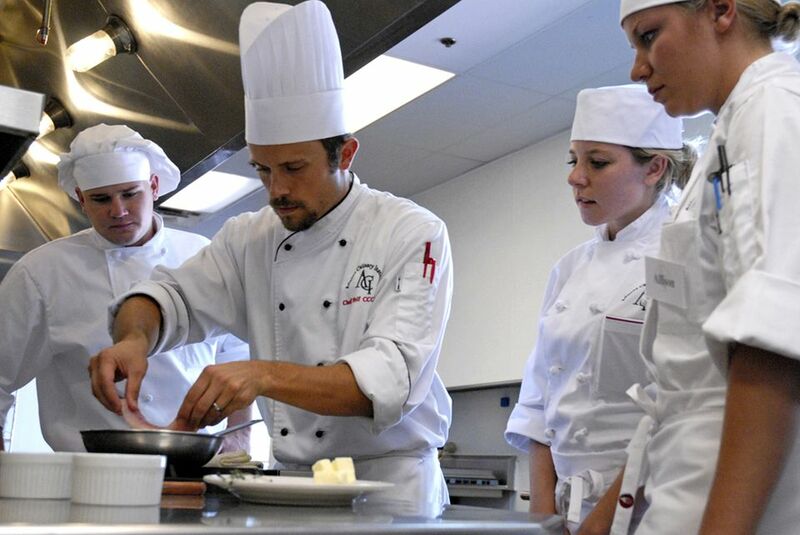 The culinary school at Scottsdale Community College offers both a lunch menu and a dinner menu to the public, so their students can obtain real-life experience in the program. You can also arrange a private party to be hosted by the culinary students. Scottsdale Community College is located in Central Scottsdale. Not everyone wants to attend culinary school and become a professional chef or restaurant manager. Everyone can enjoy cooking and learn from the pros without making a professional commitment! Here are some businesses in Phoenix and Scottsdale that offer cooking classes for everyone. Cooking classes can also make a great date, or a unique gift for the person who has everything. These classes are open to the public, and are non-credit workshops designed to impart knowledge and to have fun. Generally, classes will run from 2 to 4 hours. Andy Broder has been a cooking instructor since 1998. He is a member of the International Association of Culinary Professionals (IACP) and the American Culinary Federation. He offers hands-on classes, demonstration classes, tastings, private cooking class parties, and more. Located in Central Scottsdale. The Cooking Joynt offers cooking classes geared to people who have a desire to learn to cook, without being intimidated. Classes are all hands on, practical classes, approximately three hours in length. At the end of class participants sit down together and dine on the evenings work. "What sets us apart from other cooking schools and classes is the practical aspect of our school. You don't need any knowledge or skill to take any of our classes. Another feature of our class is that all of the ingredients used in the recipes are store bought at any grocery store, there is no need to go to specialty or exclusive stores. We make good cooking fun, and show it's simplicity." Cooking with Trudy is a home-based cooking school in West Phoenix. Experience a class and leave inspired to return to your own kitchen and create the menu you learned and tasted. These cooking classes are appropriate for co-workers, girls night out, date night, to purchase as gift certificates for newlyweds or just as a gift to yourself and, in turn, a gift to your family. There are 10 seats available at each class. Les Petites Gourmettes is a hands-on school. Children, ages 8-17, create a full menu based on various themes each day. The kids cook the menu and sit in the formal dinning room to enjoy the food. Classes are offered during the summer and are six weeks in length, Monday through Thursday for 2-1/2 hours per day. Les Petites Gourmettes Childrens Cooking School is located in North Scottsdale. Love’n The Kitchen is a home-based gourmet cooking school. Classes offer a theme-based cooking experience by live demonstration with participant interaction. Adult classes, kids classes, corporate/private parties. All classes qualify attendees to attend quarterly top Valley Chef events. Located near Desert Ridge, in North Phoenix. Both demonstration and hands-on classes by local professionals. Sweet Basil Gourmetware & Cooking School is located in North Scottsdale. Morning and evening sessions available, as well as one hour lunchtime classes. Praparat Sturlin founded the Thai Gourmet House Cooking School in 1989 in Scottsdale. She teaches "chefs, teachers, recreational cooks and culinary enthusiasts through intimate, intensive hands-on classes."